Blockchain technology — with its shared, distributed ledger that allows users to collaborate and verify transactions — has companies searching for ways to deploy it in their supply chains and save money. Looking into the latest developments, it appears that blockchain holds a good amount of potential when paired with the internet of things (IoT), the devices that will measure processes or be deployed remotely via the internet for business uses. Many firms are searching for ways to increase automation, including by using IoT and blockchain. Deloitte’s 2018 Blockchain Survey revealed that 53% of companies surveyed were working on supply chain uses for blockchain and 51% are seeking IoT uses for blockchain. In the U.S., 41% of respondents planned to spend $1 million or more on the technology in 2019. In China, that number was 85%, the study indicates. The combination of IoT and blockchain technology allows organizations to share a single source of truth, an easily accessible record of account than cannot be modified after data has been recorded. 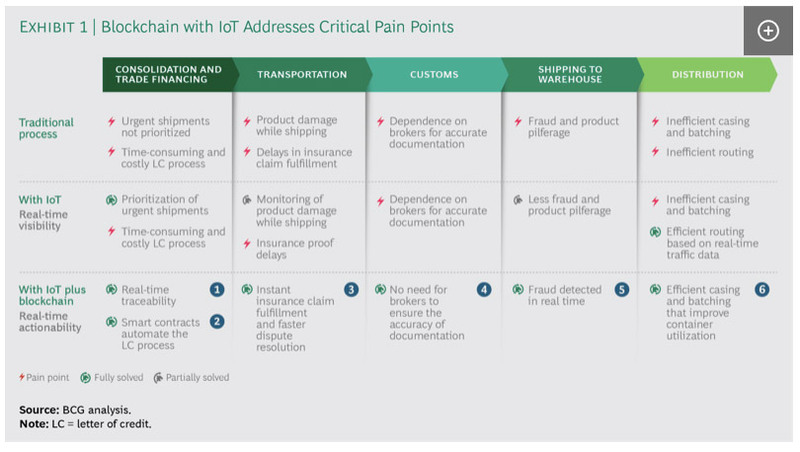 Boston Consulting Group partnered with Cisco Systems in July and examined 35 uses cases for blockchain and IoT still in the proof-of-concept phase but that nevertheless revealed some of the important economic impacts that technical upgrades will have as adoption grows throughout different industries. When IoT technology — like RFID tags (radio frequency identification tags) and advanced imaging technology — allow businesses to know the precise location and condition of their goods in transit and at retail, batching and routing of goods can be significantly improved to reduce idle stock and in some cases eliminate the need for letters of credit (LC) that guarantee payment for the delivery of goods, freeing up working capital and reducing warehousing and financing costs. Brokers who mitigate risk by certifying documents, aid in regulatory compliance and otherwise generally profit as a trusted third party between transacting businesses will also become a thing of the past as blockchain automates the bulk of these tasks. BCG estimates that these logistics and storage enhancements integrating blockchain technology could generate net savings of 0.4% to 0.8% of revenue versus an IoT system that does not leverage blockchain. What’s more, additional integration and optimization of these technologies in areas like returns, procurement and production planning are suspected to yield even greater cost savings when combined with expanding existing proof-of-concept IoT/blockchain programs. If you’re wondering where you can see blockchain technology implemented in other real-world situations, look no further than some of the largest corporations that are already deeply involved in supply chain management and technology. Partially as a response to recent E. coli outbreaks in the U.S. and growing global concerns over food safety and sourcing, Steve Banker at Logistics Viewpoints reports that Walmart has partnered with IBM and will require suppliers of leafy green vegetable products to upload their shipping and sourcing data to a permissioned blockchain no later than September 2019, and will require the same from more fruits and vegetables the following year. IBM’s Food Trust ledger will allow participants to send traceability data to the blockchain free of charge, while an analytics platform launched in October 2018 is available as a software package to businesses with a variety of tiered pricing and feature options to better understand quality and efficiency pain points. Global shipping firm DHL and Accenture teamed up in 2018 to deliver a report on blockchain applications alongside a prototype for recording serialization of pharmaceutical products and other commodities that suffer from frequent counterfeiting and imitation. The system logs information about manufacturing and transportation of these goods and can share it with stakeholders like pharmacies, hospitals and doctors to better identify instances of fraud and other fake products, even helping to identify and eliminate counterfeit medicine found at online retailers and other budget medical care providers as the tracking technology proliferates. Hyperledger, a blockchain protocol backed by the Linux Foundation and Intel, is being examined by NASA for potential use in air traffic management, and it is of particular interest to financial firms like Barclay, who recently hosted a “hackathon” to accelerate interoperability of enterprise blockchains and popular public blockchains like Ethereum. IBM and Maersk’s Tradelens blockchain program has seen a slew of adoption in 2019, first by Ford to track the sourcing of cobalt in their supply chain and most recently by the Port Authority of the Bay of Algeciras on the southern coast of Spain, one of Europe’s largest and busiest ports. One underdog player to keep an eye on is Citizens Reserve, which has a blockchain-based supply chain solution called SUKU. The upstart firm has partnered with RFID and IoT solutions provider Smartrac to develop a more streamlined solution for supply chain management integration. 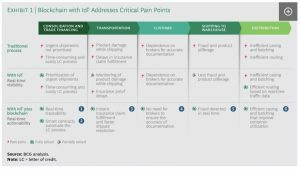 A key feature is better track-and-trace capabilities as products move through the supply chain. Smartrac Chief Technology Officer Dinesh Dhamija explained how it will work to Forbes. “The combination of Smartrac’s digital enablement capabilities along with Citizens Reserve’s SUKU platform will provide a unique identity for each physical product with a transparent and accessible supply chain solution," he said.